Whenever you have the opportunity to share major news on air count it a good day. 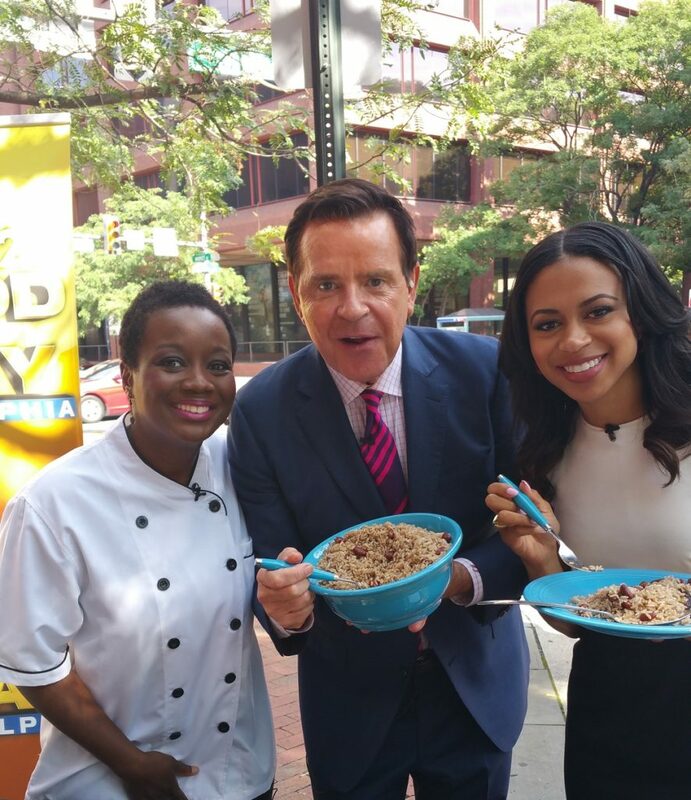 And that’s the day Jade Jamaican Grill enjoyed recently when I stopped by Good Day Philadelphia to dish about my company’s participation at the 2016 Democratic National Convention. This wasn’t my first time on television or at FOX 29 News for that matter. I’d been on with host Mike Jerrick and his colleagues numerous times over the years. But this particular appearance with Jerrick and his co-host Alex Holley took the cake! Here I was – one of a select group of small business food vendors chosen to provide tantalizing tastes at this major national event. And not just one event either. JADE was selected for two; the Media Party on Saturday, July 23rd at Citizens Bank Park and the Welcome Delegate Party at the Kimmel Center for the Performing Arts on Sunday, July 24th. So a few days prior to the start of the convention I took the opportunity to air things out on live television by showcasing the bites JADE would be serving at the DNC. Let’s just say our hosts could not keep their forks or fingers off the food. I mean chunks of spicy Jerk Pork and heaps of savory Rice and Peas disappearing in plain view. You can’t make this stuff up. See for yourself. It really was a good day to air things out! Have you heard? JADE is heading to the DNC! JADE Jamaican Grill has been selected to participate in the 2016 Democratic National Convention coming to Philadelphia. The DNC will be taking place July 25th through the 28th and our company is among a select group of food vendors chosen to satiate the palates of tens of thousands at this national event. We will be serving up some of our signature Full on Flavor fare at the Media Party on Saturday, July 23rd at Citizens Bank Park and at the Welcome Delegate Party on Sunday, July 24th at the Kimmel Center. How lucky are we? By luck I mean preparation, hard work, sacrifice and perseverance coming face to face with opportunity. I thank the DNC for this tremendous honor and I look forward to taking part in what will be an amazing event. For the latest news and to learn more about our company visit us on Facebook, Twitter and LinkedIn.